What does your dietary omega-3 intake look like? 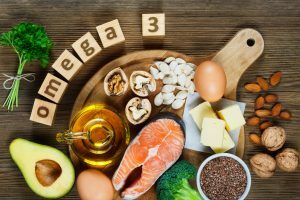 Omega-3 status can be assessed by measuring the amount of eicosapentaenoic acid (EPA) and docosahexaenoic acid (DHA) in red blood cells, which is called the Omega-3 Index. The primary food source of EPA and DHA is fatty fish such as salmon, mackerel, herring, sardines, and tuna. Plant oils, such as flaxseed and soybean, contain alpha-linolenic acid (ALA), another omega-3 form that can be converted to EPA and DHA, but the conversion rate is very low. In 2017, GrassrootsHealth added questions about dietary omega-3 intake to its questionnaire to collect the typical number of meals containing fatty fish or plant-based omega-3s per week. Following is a summary of what we found so far about omega-3 dietary intake among GrassrootsHealth participants. How much fatty fish do GrassrootsHealth participants eat per week? 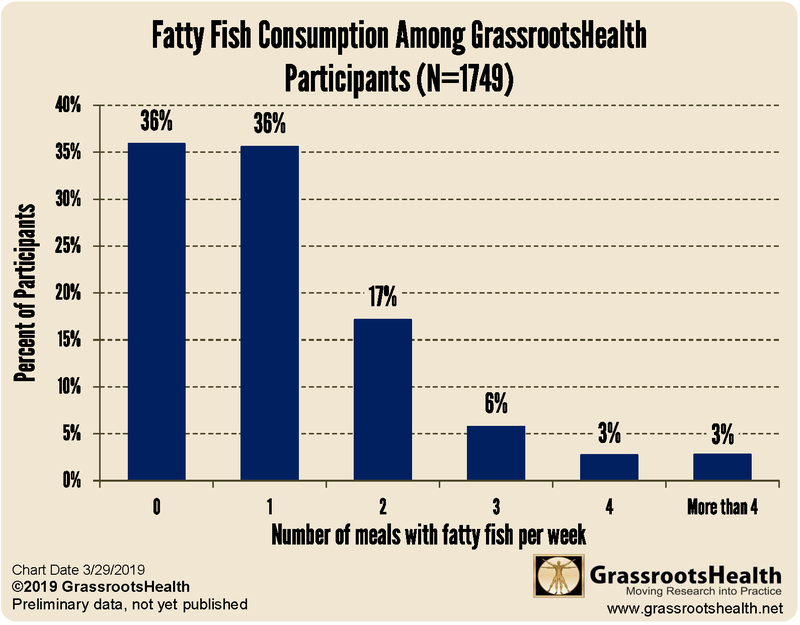 The chart below shows the typical number of meals with fatty fish per week among 1,749 GrassrootsHealth participants. Nearly three quarters (72%) consumed less than two meals with fatty fish per week. The most common types of fatty fish were salmon, sardines, and tuna. 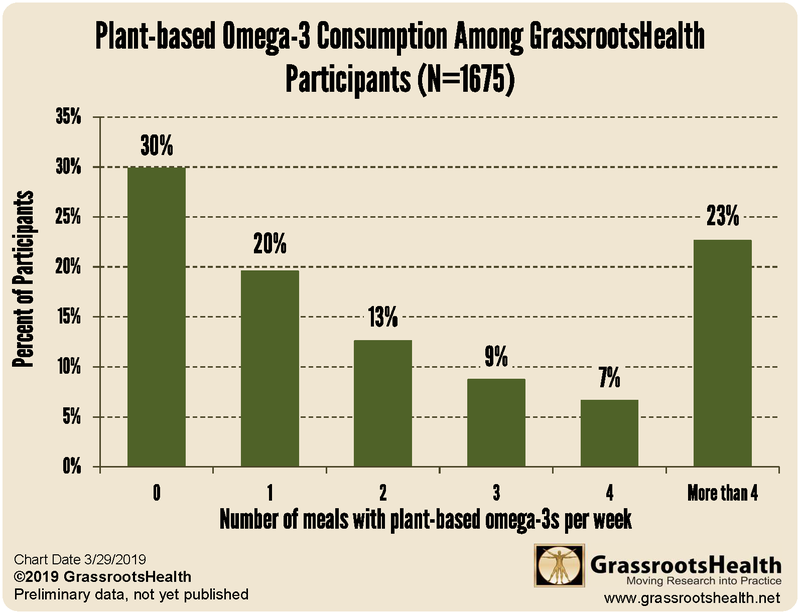 How much plant-based omega-3s do GrassrootsHealth participants eat per week? The chart below shows the typical number of meals with plant-based omega-3s, such as flaxseed, chia seeds, or walnuts, per week among 1,675 GrassrootsHealth participants. Half (50%) consumed less than two meals with plant-based omega-3s per week, but almost a quarter (23%) had at least 5. How does this compare to other populations? According to the 2015-2020 Dietary Guidelines for Americans, approximately 90% of U.S. adults consume less than two meals with fish per week. While GrassrootsHealth participants as a whole consume more fish than the general U.S. population, fish intake is much lower than the Japanese population, which is about 1 serving of fish per day. In Japan, there is a very low rate of cardiovascular disease, which has been linked to their high fish consumption and correspondingly high omega-3 index levels (greater than 8.0%). How can I find out my Omega-3 Index? GrassrootsHealth offers an Omega-3 Index test which indicates long-term (about four months) intake of EPA and DHA from food and supplements. Evidence shows that an Omega-3 Index of greater than 8% is optimal for health and less than 4% is deficient. Test your levels today! How can I track my dietary omega-3 intake and nutrient levels? To help you track your nutrient intake and nutrient levels, GrassrootsHealth has created an online tracking system called myData-myAnswers. You can track your fish and plant-based omega-3 consumption, as well as your omega-3 supplements.This will help you know your true omega-3 intake and the intake amount you need to reach and maintain optimum nutrient levels. See our special offer above.